Is It Expensive to Start Working Out? I can’t tell you how excited I am to hear that several of you are involved in or have now started a workout routine of some kind!! Way to go! I am also very excited to have Jen, from Getting Fit With Jen, on board here to help answer so many of our fitness questions. She has taught me so much while we’ve been working out the past few months. It would appear that I’m not just getting fit, I’m becoming a little bit smarter too. How ’bout that? Several of you have already taken advantage of Jen’s personal online training services, which I know will be a blessing to you. Having someone tell you exactly what you need to do, having someone to be accountable to – I find it all so helpful. Today, I was able to bend Jen’s ear for a little while and ask her some questions about fitness and finances. If money is holding you back from getting started in a workout program, I think you’ll like what Jen has to say. Laura: How much would you say it costs to get started with a workout program? Laura: Ha! I’m pretty sure I could find a bag of wheat around here somewhere. :) So you really think a person can have an effective exercise routine without spending any money at all? Laura: If someone does have some money to invest in their fitness journey, what would you recommend they look at first? Jen: The first thing that comes to mind is a good pair of shoes, if you don’t already have some. A set of resistance bands or dumbbells are also great to have. Resistance bands are very inexpensive, very versatile, and they don’t take up much space. Once you know you’re serious about exercising, some high quality workout DVDs can be a great investment because you’ll have them forever, and you can workout at home when it is convenient for you. There are some other pieces of equipment that you may appreciate owning (like an elliptical machine or a tread mill), but be sure you’re serious about using them before you take the financial plunge. Laura: Is there anything you would say is NOT worth spending the money on in order to get fit? Jen: Watch out for any product that “guarantees results”. Some of them are legit, but not all of them are. I’ve seen some gimmicky workout equipment that simply isn’t necessary, such as “ab belts”, which promise to give you a six pack. If you want a six pack, you’re going to need to work for it! Save your money for some of the above mentioned gear and be ready to invest time and energy into achieving the results you’re looking for! 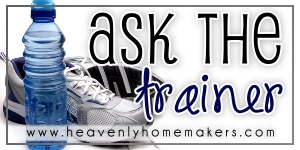 Watch for more of your questions to be answered in our “Ask the Trainer” feature next week. Have more fitness questions? Be sure to leave a comment here. And check out Jen’s site, Getting Fit With Jen for more great fitness information. You can also youtube workout videos! There are some great free videos out there! I did this one yesterday! And this is a good beginner one! I have a question… I’m expecting my third child in 8-12 weeks, and I’m determined to get back in shape ASAP this time. What advise do you have to get your pre-pregnacy body back? Also, my midwife doesn’t want me to “work-out” for the first 6 weeks after having the baby. Do you have any ideas for getting excercise that don’t require a lot of movement in the legs? Just wanted to add that for some (like me!) getting a good pair of shoes was not an option. I began walking/running regularly at the beginning of the year and very quickly developed ankle pain due to pronating ankles. I quickly realized that the only solution was to get fitted by a professional and spend more than I’d like on running shoes rather than using my old ratty tennis shoes. All pain disappeared immediately and I completed my first 5K last weekend! Your local library and Youtube are great resources for exercise videos and the best part is they’re FREE! You can turn your home in to a gym if you just look around. Stairs, chairs, and other household things can be great tools for your workouts and strength training. I think hulu.com also has some free workouts. There is a website called sparkpeople.com which has some free workout videos as well. I think you have to sign up first though (it’s free to sign up). Thank you for this post. I really need to kick start my exercise and you have given me some good ideas. I have a question for Jen about the slim in 6 video series mentioned in the article and on her website. The program includes a diet plan but does not give much information about it. Would the diet be compatible with the real food way of life? Or is it low fat/diet foods? Thank you for your help and any insight you might have in regards to the diet itself.